Foamed-Polyethylene Insulation: Any solid material adjacent to a conductor is actually part of an imperfect circuit. Wire insulation and circuit board materials all absorb energy (loss). Some of this energy is stored and then released as distortion. 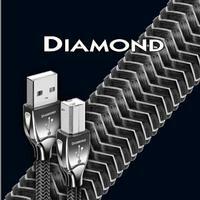 Diamond USB uses air-filled Foamed-Polyethylene Insulation because air absorbs next to no energy and Polyethylene is low-loss and has a benign distortion profile. Thanks to all the air in Foamed-PE, it causes much less of the out-of-focus effect common to other materials.